In this video Georgia Papaioannou, student of Engomi Gymnasium- Kyriakos Neocleous, presents the ePortfolio that she has created as part of the Physics and Modern Greek subjects and particularly in the units ''Static and Dynamic Electricity'' and ''Racist speech'' respectively, in which the ATS2020 learning model had been incorporated. The video is in Greek, however you can watch the 3 versions of the video (with english subtitles, with greek subtitles and without subtitles). 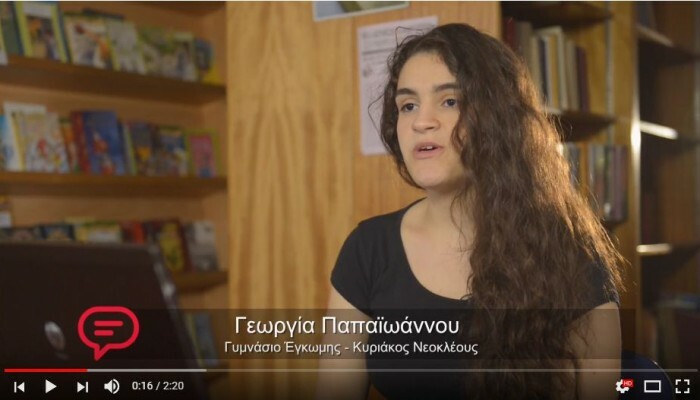 In this video Olga Kyriakou, student of Engomi Gymnasium - Kyriakos Neocleous, in Cyprus, presents the ePortfolio that she has created as part of the Modern Greek subject and particularly in the unit ''Racist speech''. In this video Melina Stavrinidou, student of Polemidia Gymnasium, in Cyprus, presents the ePortfolio that she has created as part of the Modern Greek subject and particularly in the unit ''Nutrition and Health''. In this video Giorgos Savva, student of Lympia Primary School, in Cyprus, presents the ePortfolio that he has created as part of the Modern Greek subject and particularly in the unit ''Time Machine''.